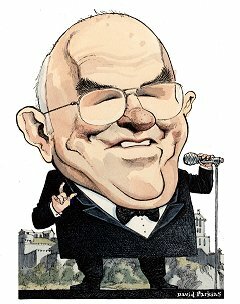 In today's edition of The Guardian, Clive James reflects on why he thinks, even forty years after his first appearance there, he still has something to bring to the Edinburgh Fringe. Forty years ago, he blew into Edinburgh with a jazz and poetry show. 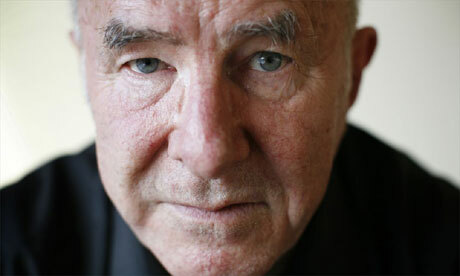 Now Clive James is back. But is the old magic still there? Preparing for a week of solo evenings on the Fringe, I check myself out in the mirror. What have I got to offer? Well, physically not a lot. When Hitler conducted a similar self-examination before his next big speech at Nuremberg, he could at least see a pair of sharply focused eyeballs staring back at him, and his moustache had not yet lost its vibrancy. No part of my face remains vibrant. There are veteran quinces with more magnetism. But it won't matter as long as I can still talk. Talking solo for an hour on your feet is usually called standup, and right there is the first source of fear. The term "standup" is reserved for comedians, and nowadays there are hundreds of them, most of them so technically proficient that they can spend 55 minutes telling the story of what they had for breakfast while they roam the stage like wild animals. The last five minutes is consumed by the apocalyptic applause of the audience, uniformly hoarse from too much laughter. Gasping people clap until their hands bleed while the standup comedian sticks the microphone in his mouth and imitates a blender. I can't beat that. My only hope is to do something else. Back in the late 1950s, when I first started paying attention to this kind of thing, there were about half a dozen people in the world who could just go on and talk. Mostly they sat on a bar stool, so it wasn't, strictly speaking, standup. Mort Sahl, my favourite, just talked about life but put a twist on it. Eventually he disappeared into the mists of conspiracy theory, but he had already been outflanked by another American, Jonathan Winters, who could use the microphone to imitate a tortoise crossing a freeway. Standup took off irretrievably into the realm of pure comedy. The subject mattered less and less, the continuous laughter more and more. You won't catch me knocking that, but you won't catch me trying it, either. I want to talk seriously. I just don't want to get lynched while I'm doing so. How to avoid that is the question. I started looking for the answer about 40 years ago, in Edinburgh. A Cambridge Footlights revue that I had directed was a hit on the Fringe, partly because I had been sensible enough not to include myself in the cast, who were all a lot funnier than I was. Hungry for a share of the limelight, I staged a poetry and jazz show in the afternoons, with all the jazz devoted to backing my poems and all the talking done by myself. In the evenings, our venue was packed for the revue. In the afternoons, a thin scattering turned up to hear me. They had their priorities right, but I couldn't help noticing that when I went off script and improvised, there was a rapport. The rapport was especially intense with a small woman in the third row who wore two overcoats at once and followed me around for several days reciting her own poems to me while running to keep up. I had also, however, got the occasional laugh from the normal people. Nothing to shake the rafters, but still it was heady wine. The addiction had taken hold, and in subsequent decades I slowly got better at holding an audience just by talking to them. The scariest part is that you can always tell when you aren't holding them. They start to cough, first individually, then in chorus. Finally they are being conducted by Toscanini. The only way to stave off the coughs is to say something interesting. For that, part of the secret is confidence. You have to believe that what you're saying is worth the crowd's time. It's a hard ask, when you consider that even Mark Antony needed Caesar's corpse for a prop. The other part of the secret is to pack the line. As on the page, what you say on stage should give value for money, bringing a lot in. I learned something about how to do that when things went haywire in the TV studio and I felt bound to keep the studio audience entertained until the glitch was repaired. A warm-up man usually does that job, but I thought we could save a salary if I did it. To my delight, I found that the audience sometimes relished what the people at home weren't getting. When I finally left mainstream television at the beginning of the current millennium, I went in search of stage audiences who might feel the same. One of those audiences was in Edinburgh. At the Pleasance, I did an hour with Pete Atkin, with whom I write songs. A whole new generation had grown to maturity since I was last on stage in Edinburgh. In the courtyard of the Pleasance, my daughter's boyfriend was running the World's Smallest Cinema, which could hold an audience of two people. All the same old mad stuff was happening but most of the people were different, and I wondered, when I went on for the first show, whether time hadn't left me behind. The audience in Edinburgh, if you can pull them into the tent, is in search of adventure, but there are limits - and we were a pair of old timers, neither of whom resembled Russell Brand. Yet things went gratifyingly well. It was no surprise in Pete's case: he'd been working the clubs for years. But I surprised myself out of my skin. The only man who coughed while I was talking had a genuine case of emphysema. I had no guarantee, however, that I could get away with it all on my own. Literary festivals supplied some of the evidence that I might. An hour on your feet at a literary festival is usually far removed from standup, and most writers very sensibly don't try to put on a show. If VS Naipaul started telling tall stories about Ravi Shankar, you'd be worried. But the opportunity to do something other than a straight reading is always there. Over the course of five years or so I tried to develop the author's standard hour into a performance. Cheltenham was a good venue for that, but the best of all, once again, was in Edinburgh, at the Book festival, where an hour in the big tent turned out to be a hot gig, as they say in the trade. Armed with this new knowledge - I won't call it expertise, because half the time I still didn't know what I was doing - I undertook a tour of Australia last year, playing a total of 30 solo dates all over the country. Finally, I went on alone at the Sydney Opera House. The joint was full and it must have worked, because next day I was still in one piece. To disappoint that many Aussies all at once is never wise. Time, then, to bring the idea back to where it started, under the shadow of Edinburgh Castle while the city teems with ticket-buyers and every spare room in town is a squat for the young and hungry. The only justification for taking some of their limelight is that you, too, are convinced that you are at the start of something. In the afternoons, I'll be hosting conversations on stage with some of the festival's stars, which isn't quite the cinch it looks, but after 20 years of doing the same sort of thing on television I would deserve punishment if I couldn't bring if off. In the evenings, though, I'll be going on alone. And it still feels like the start of something new. For one thing, it's something the young can't do, because they haven't lived long enough to reflect on the experience of growing older. But I'm not just after the sigh of recognition from older people in the audience when I make cracks about how I can't get out of my front door without forgetting my Freedom Pass. I want to tell the younger generation about how time will happen to them, and they're lucky if it does. Will they listen? Will they even turn up? Only one way to find out. This, incidentally, is the online version of Clive’s essay. The print version has got two David Parkins illustrations worthy of attention, and certainly making the the paper price of £.80 good value. This, incidentally, is the online version of Clive's essay. The print version has got two David Parkins illustrations worthy of attention, and certainly making the the paper price of £.80 good value. A huge thank to David for his approval on our use of these images (c) 2008 David Parkins. thanks for posting, Kevin and Steve. Those pictures are just great. And Pete in there too! The Guardian article sounds as if written by someone who knows the songs well enough to make a reference to one of them? Been enjoying "The Road of Silk" and "Secret Drinker" today - love "The Wall of Death" "I See the Joker" (makes me think of Big Ger Cafferty in Ian Rankin's Rebus stories) and "Rain-Wheels". Clive James is convinced that one of the many sketches he directed for the Cambridge Footlights revue at the Edinburgh Fringe 40 years ago was at least the equal of Monty Python's "Dead Parrot" sketch. "I actually think it was the best sketch ever," he says, freighting that familiar Australian drawl of his with just enough mischief to make him sound self-mocking. "Slow Motion Wrestling" involved the enactment of a wrestling match "as if the whole thing was happening in freeze-frame", he explains, with even the referee barking instructions at a grotesquely slowed-down rate. It was, he remembers, "screamingly funny". As he recalls in his memoir of his Cambridge days, May Week Was in June, with a typically erudite flourish: "It was a piece of sculpture extended into time, an elastic Laocoön, a brawl by Balanchine. Nothing could justify so much effort, and that was its justification."